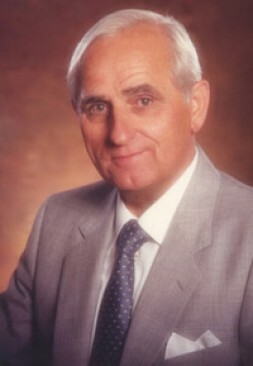 "My father Georg-Guenther Hoffmann (1918-2003) from Liegnitz in Silesia – now in Poland – and my mother belonged to the 12 millions Germans who were expelled from the Eastern German territories to the West after World War II. They suffered from the loss of identity and home roots but renounced violence and – like the representatives of the displaced Germans in their famous 1950 declaration – accepted that injustice cannot be healed by further injustice." Among the 12 million Germans who, collectively and without consideration of their individual fault, were expelled from the German Eastern territories (Silesia, East Prussia, Pomerania, and Sudetenland) to the West after World War II, were also my parents, Christa-Maria Hoffmann, née Niestroj, and Georg-Günther Hoffmann from Liegnitz in Silesia. Precisely my father suffered from this loss of his identity and home roots and considered it a great injustice. Like many of his fellow displaced, however, he decided to renounce violence and accepted that injustice cannot be healed by further injustice. This self-commitment to renounce revenge by the largest group of displaced persons in the last 100 years should serve even today as a beacon, and a cornerstone in the new foundation of an anti-displacement policy. It should be a precondition for reconciliation and a successful peace policy. The topic of displacement is, sadly, highly current: in Congo, Iraq, Afghanistan, Pakistan, Georgia, the Balkans, Palestine or Sudan. 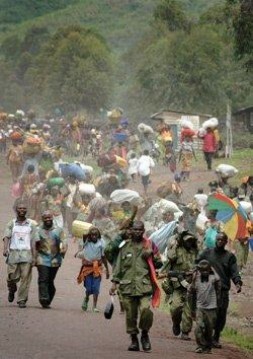 The instruments of international law developed to date are not able to effectively deal with ethnic displacements and discriminations, as the ongoing inaction in Congo or Darfur makes all too clear. The world deals with the topic of displacement as a side note, and forgets that ethnic cleansing and the predicament of minority groups are one of the greatest contributors to the intra- and international conflicts of today and tomorrow. This important issue in the field of human rights has not been effectively addressed. Major actors of politics and diplomacy are content to issue declarations and hold hopeless discussions at the UN, where one can be sure that the perpetrators of abuses have a veto power behind them to block any condemnation of their atrocities in the Security Council. The generally too late and mostly ineffective international reactions to new abuses should now be replaced by a new International Charter against Displacements (ICD), which allows quick and pointed sanctions against abusers and creates legal certainty in our world. Which elements should a new International Charter against Displacement have? In the pre-amble of a new anti-displacement Charter, the various international bans on displacement to date should once more be explicitly stated as a basis for further action. For example, according to Article 49 of the IV Geneva Convention on the Protection of Civilian Persons in Time of War from Aug. 12, 1949, forced relocations are expressly forbidden. Article 17 of the second appendix to the Geneva Convention of 1977 explicitly forbids displacements in intra-state conflicts. In times of peace, displacements violate the UN Charter, the Universal Declaration of Human Rights of Dec. 10, 1948, the human rights pacts of 1966 and the International Convention on the Elimination of All Forms of Racial Discrimination. According to Article 8 of the state of the International Criminal Court of 1998, displacements are a war crime. "Almost all ethnic cleanings are justified on the grounds of historical collective guilt of minorities. Real or supposed injustices should be atoned for with expulsion. Certain ethnic groups are made into scapegoats for social problems, or for the wrong policies of their past or present leaders. This pattern must be broken through the new Charter. 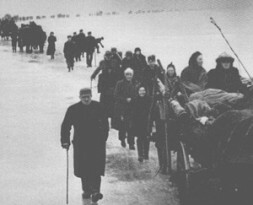 "- Here ethnic Germans flee from East to West in the historic mass expulsion away from their historical homeland in 1945. Adolf Hitler had started WW II, tried to enslave the Polish population, killed 6 millions Jews, attacked Russia and lost all. The ethnic Germans of the Eastern territories paid the price for this brutal dictator collectively, whether they supported him or not (actually Hitler never got more than 50 percent of the votes in any free election). Meanwhile, the Polish lost their own Eastern provinces to the expansionary zeal of dictator Josef Stalin and had to flee to the West, as well. The first ethnic group which had to flee from East Germany and Poland were thousands of Jews in the late 1930’s to escape the increasing repression and brutality of the Nazis. Most ethnic cleansings are justified on the grounds of the historical collective guilt of minorities. Real or supposed injustices should be atoned for with expulsion. Certain ethnic groups are made into scapegoats for social problems, or for the wrong policies of their past or present leaders. This pattern must be broken through the new Charter. The Serbs in the Balkans, for example, are not collectively responsible for the massacre at Srebrenica, but rather the corresponding politicians and military leaders of the time. It is not the Russians in the Baltic who are responsible for the “Russification” of Lithuania, Latvia, and Estonia, but only Josef Stalin and his totalitarian policies. The cycle of guilt and collective guilt must be broken and aggressively discussed. At the initiative of the EU and in a progressive new transatlantic partnership with President-elect Barack Obama, a new International Commission against Displacements (ICD) should be established through a new international treaty against displacement. It should be based in a significant European capital like Berlin. This Commission should prepare the preliminary work for the International Criminal Court (ICC) in The Hague and concentrate on the particular problems and possibilities for solutions of displacements. Neither the ICC nor other UN organs have proved sufficient for this task thus far. The new commission, using its own financial means, employees and a connected research institute should achieve the following goals. The global history of displacements should be thoroughly reviewed, and from this, important implications for the future should be extracted. This process is not about the assignment of guilt, however, but the question of how displacements can be effectively prevented, how the displaced can be helped, and how an effective reconciliation process between hostile ethnic groups can be initiated and implemented. The ICD will issue a series of handbooks containing suggestions and best practices from around the world, ready to be used in new conflicts like now in Congo or Georgia. A Documentation Center against Displacements could collect facts and data about displacements worldwide without consideration of political sensitivities. This could work similarly to the Central Registry of State Judicial Administrations in Salzgitter, Federal Republic of Germany, which collected all known cases of human rights abuse by the German Democratic Republic through 1989. The Commission could install several organs of an Arbitration Commission. Every person affected by displacement can turn to the Commission. A Claim Panel decides in a preliminary proceeding on the constitution of either an Arbitration or Grievance Panel. The Arbitration Panel decides in the cases where the relevant countries have submitted to the arbitration proceedings of the International Commission against Displacements. In disputed cases, the case could go to the Grievance Panel. The Grievance Panel decides independently on the displacement case. It orders investigations, questions those affected and decides in fast-track and long-term proceedings. Observance of decisions is guaranteed through a bundle of effective and creative sanctions. For example, the following could be used against perpetrators of displacement: travel bans for groups of persons, bans on flying, freezing of accounts, confiscation of ships and airplanes, stipulation of reparation payments of up to €500 million per year of abuse, bans on bank transactions and exports and imports, and prosecution at the International Criminal Court or International Court of Justice. Our international legal system is perverted: whoever can convince even one veto power in the UN Security Council, can commit any war crime or abuse of human rights without fear of consequences. The option of military action without UN approval – as happened in Kosovo – is not an optimal solution and cannot bring peace but only stop the largest atrocities. We need new, creative and effective tools for peacemaking. In the beginning, not all 192 UN member states will choose to sign a new international treaty against Displacement and join the International Commission, but certainly the countries of the EU, the new America under the new president Obama, most probably Russia, and countries in Asia, Africa and Latin America, i.e. countries with in total several billion people, large influence and great economic and political power. It would be especially important to include new emerging powers such as e.g. India, Brazil and the Gulf States in this system and that it not be a Western European-dominated instrument. Right now, the West is relying either on a paralyzed UN or an aggressive military strategy – there is no healthy middle of instruments between inaction and war. "The topic of displacements is, sadly, highly current" – like here, in the Congo, where over a decade of fighting has left four million dead and continues to displace innocents on the basis of ethnicity. The ban on displacement is already anchored in international law. As such, an international commission represents not a contradiction but rather the execution of these agreements. National sovereignty is not breached, as the signatories to the above conventions have all committed themselves to upholding a moratorium on displacement. Darfur and Congo: the Commission should not wait for a decision by the UN Security Council, which could be blocked by China or Russia, but should impose sanctions, including a ban on the import of weapons from foreign countries. The ongoing displacements must be strongly condemned and dealt with now. Georgia: the International Commission against Displacement impartially examines the events which have taken place in South Ossetia and Abkhazia over the past decades and during the conflict this year, and issues recommendations on the protection of all minorities and political reconciliation. Estonia: the Commission oversees the treatment of the Russian minority in this EU and NATO member state. Impartial information is delivered to defuse radicals on both sides. Balkans: the Serbs outside of Serbia as well as other minority groups are protected through the actions of the new Commission, especially in the newly independent Kosovo. The international community needs new, effective instruments to more effectively and expediently prevent displacements and ethnic cleansings anywhere in the world and to ensure reconciliation between ethnic groups as an important part of peacemaking. These must not be neutralized by the perpetrators themselves, being reduced ad absurdum. Wherever the trust of people in justice is not satisfied, the power of the strongest, war and violence are the result. This is where we stand in the world now – doing nothing or too little, too late to prevent ethnic displacements and cleansings. Time for change has come. President-elect Barack Obama and the Europeans should now pursue justice for the displaced with creativity and determination and, due to our historical responsibility, ensure that the “better future for all” that the displaced Germans spoke of is realized. The establishment of an International Charter against Displacement could become a new, credible and effective tool in the almost empty toolbox of the soft factors of peacemaking. My father as well as all fathers and mothers of the millions of displaced human beings on the globe wait for it – "Networking a Safer World" for our children. CANADA'S WILDFIRES TOUCH THE SKY!